Lately, I’ve been reflecting on lessons that I’ve learned since changing my career path and branching out on my own 4 and 1/2 years ago. Trying to pursue a new field in which I had no prior experience and grow a business feels like a rollercoaster most of the time. There are many ups and downs! Disappointments. Set backs. Progress. Self-Doubt. Excitement. Stress. Gratitude. Growth. Burn out. Deal Breakers. It’s been such a crazy ride, but I wouldn’t change it for the world. Well, there is one thing I would do differently – I would’ve hired an accountant much sooner than I did. They are worth their weight in gold. Other than that, I’m a firm believer that the mistakes and tough times are incredibly valuable. I’ve learned to believe in myself which was never something that came to me naturally. I’ve turned down opportunities and walked away from deals because they didn’t have my best interests at heart. While scary at the time, those are some of my proudest moments because I was true to myself and what I believe in. Whatever path you happen to be on, believe in yourself. Stick to your guns if it’s important to you! When you have a bad feeling about something, listen to your gut. And most importantly, don’t let someone else convince you that you’re nothing without them. It just isn’t true. You might just be one person, but you are everything to your vision. Maybe your journey won’t look exactly as you thought it would, but sometimes that’s for the better anyway. If you have the passion and drive for something go after it and share it proudly with the world. We’re anxiously waiting to see it. I’m happy to say that I’m getting into a good groove again with recipe development. Look at me posting on a Saturday of all days! Recipe ideas are starting to flow and most of my trials are turning out, almost effortlessly at times. It feels good after a long period of feeling drained on the creativity front. For the first time in a long while, I actually know the next recipe I’m posting on this blog which hasn’t happened in probably 6 months. hah. (Spoiler alert – you’ll never see Tabbouleh the same way again). This pie. Finally, I get to this pie. Well, it didn’t last long! What else is there to say? I threw together a simple crust made with almonds, oats, coconut oil, and maple syrup. As I’ve mentioned many times before, I prefer this type of press-in crust over traditional flour pie crusts because the flavour is just incomparable. Plus, no rolling or kneading. It’s a no brainer. The other day I was making my 2-Ingredient Chocolate Frosting and I realized it would make a fun, truffle-like pie filling because it hardens nicely when chilled. I paired it with a warm strawberry vanilla compote to serve on top. The compote is totally optional, but the cold and warm contrast was really nice! It’s also a great way to use up bruised berries that are on their last legs. Pie crust adapted from pecan pie crust. For the crust: Preheat oven to 350⁰F and lightly grease a 9-inch pie dish with coconut oil. Add almonds into a food processor and process until a fine crumb forms, the size of sand. Now add the coconut oil, maple syrup, salt, and oat flour and process again until the dough comes together. Finally, pulse in the rolled oats until the oats are finely chopped, but still have some texture to them. The dough should stick together when pressed between your fingers. If it doesn’t, try processing for a bit longer. Bake pie crust, uncovered, at 350⁰F for 10-13 minutes, until lightly golden and fragrant. Remove from oven and set aside to cool on a rack for about 20 minutes. For the filling: Chill can of coconut milk in the fridge overnight so the cream can solidify. When ready, open the can and carefully scoop out the solid white coconut cream into a pot, discarding the water. Add chocolate chips and stir until combined. Heat over low-medium heat until most of the chocolate is melted. Remove from heat and stir in the optional sweetener, salt, and vanilla until smooth. For the strawberry compote: Add diced strawberries into a pot and increase heat to medium. In a small bowl, whisk together the sweetener and arrowroot powder (or cornstarch) until no clumps remain. Add to strawberries and stir. Increase heat and bring mixture to a simmer and cook the strawberries for around 9-12 minutes or longer, until thickened and soft. Remove from heat and stir in the vanilla. Assembly: Pour chocolate filling into pie crust and smooth out. Place in the freezer, on an even surface, for a minimum of 2 hours, or until firm throughout. Allow pie to sit on the counter for 15-30 minutes before attempting to slice. Slicing the first piece of pie is quite tricky, but I promise the second slice comes out much easier! Serve the pie chilled with the optional compote on top. Wrap leftover pieces of pie in tin foil and store in the freezer for up to 1 week. Hope your weekend squeezes in some chocolate, fun, sun, & relaxation! This pie looks so beautiful! I wanted to try to make a filling with coconut milk for a while now and this one caught my eye. Going to give this a try pretty soon. Wonderful post, Ange!!! You’ve come MILES and accomplished so much since I met you so long ago, and it definitely reflects here – your blog is and forever will be one of my must-reads! I totally agree with you on the stuff about life lessons. A little while ago when I was struggling with figuring out what I want to do and trying to determine what would make me happy, I found a quote that said “You were given this life because you’re strong enough to live it”, and I have it posted on my mirror to remind myself regularly now! I hope you have a wonderful weekend, and enjoy this glorious sunshine we’re finally getting! You rock, words I needed to hear this am. And pie is my favorite food group! To be honest, I’ve only ever baked it before – I do so because I like that it firms up and gets a bit crunchy in the oven. It’s a nice contrast to the filling. I don’t think it would hold together nearly as well if it wasn’t baked, but if that isn’t an issue for you feel free to experiment with it :) Let me know how it goes if you try it out. This crust looks incredible! I stumbled upon it while searching for vegan pie crust. I’m attempting to adapt a recipe for apple pie squares to vegan so my nephew can eat it. It typically uses a cream cheese-butter-flour crust. I’m thinking this almond variation would taste great with the apple and cinnamon filling! 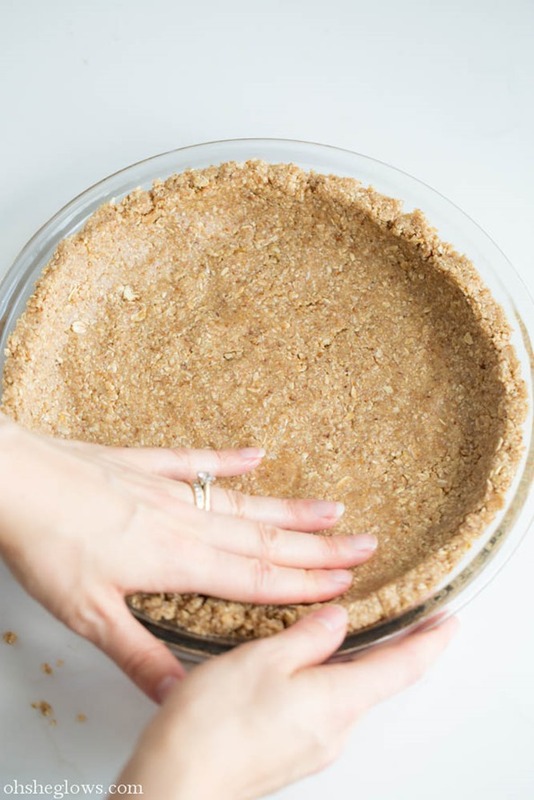 Since the filling needs to bake, do you think it would work to press out the crust and pour the filling over and THEN bake, or do you think it should be baked, even partially, first? Thanks for any input you can give! You can bake partially pure crust or not when you need to do baking any ways. However I prefer the partial bake on the crusts. I really needed to hear that little inspirational pep talk this morning. Branching out on your own can be terrifying, but so worth it! This looks super good, especially that crust! I agree, press-in crusts taste so much better. Angela, you always continue to inspire me. Inspiration to follow my dreams and to create magic in the kitchen:) And to eat a whole pie! Ha! I haven’t made a press-in crust but I can imagine it’s deliciousness. Congratulations on making it through a tough time, and feeling secure in yourself again. I know first hand, from experience and right now the feeling of undergoing change in your life, and believe firmly that successfully navigating it brings about great personal rewards. Keep your feet on the ground, and your head on your shoulders and keep up the great work Angela! You are a true inspiration to myself and many more. This sounds very yummy! Anything I can substitute for the rolled oats? I am allergic…I’m sure I can use regular flour but wasn’t sure about the actual oats. Hey Chenille, Hmm, I’m not too sure. can you have spelt or quinoa flakes? One of those might work? Or perhaps raw buckwheat flour. I too am allergic to oats, so would perhaps try the quinoa flakes if I could find them. I am just starting to try to eliminate gluten and believe spelt is also out? Recipe looks very tempting. Oh My God Angela Seriously!? How do nyou come up with these this one looks positively evil! DROOL! PS I made the rad pad thai last night for dinner- awesome! So happy you enjoyed the Pad Thai – I’m making it again tomorrow! This pie looks absolutely fabulous!! LOVE! Love this post and your blog. Keep the yummy recipes coming! I’m genuinely touched by your speech at the beginning of the post. I went through a big change in my life in the past couple years and I’ve realized that while I regret none of it, I’ve lost myself because of not staying true. I’ve just started my journey to finding myself, and remember how to do things that I used to enjoy. It’s true, you can’t please anyone, unless you please yourself first. oh, and that pie. mm mm mmm! 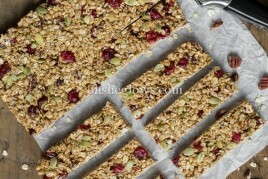 That crust – looks like it could be crumbled on top of anyting and would make a fantastic ‘granola’! Mmmm, so good! And then..the filling!! So dense, thick, dark, rich – gotta love coconut milk and chocolate. Can do no wrong. You created a stunner, Angela! Hi Andrea, Im not sure, this was my first attempt – I think lite milk would yield a less creamy and maybe “ice-milk” consistency, but not sure. Let me know if you try it out! This looks amazing! 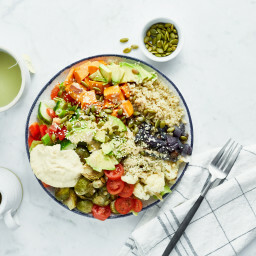 I stumbled upon your website about a month ago when I decided to switch to a vegan/gluten-free diet for health reasons. Your posts and recipes are so inspiring and I can’t wait to see more from you! What a beautiful post Angela- words and images :) You should be so proud of all you’ve achieved and even more so for staying true to yourself. I’ve made a tart with the same idea for the filling- the chocolate coconut milk mix, and loved it- insanely rich though! 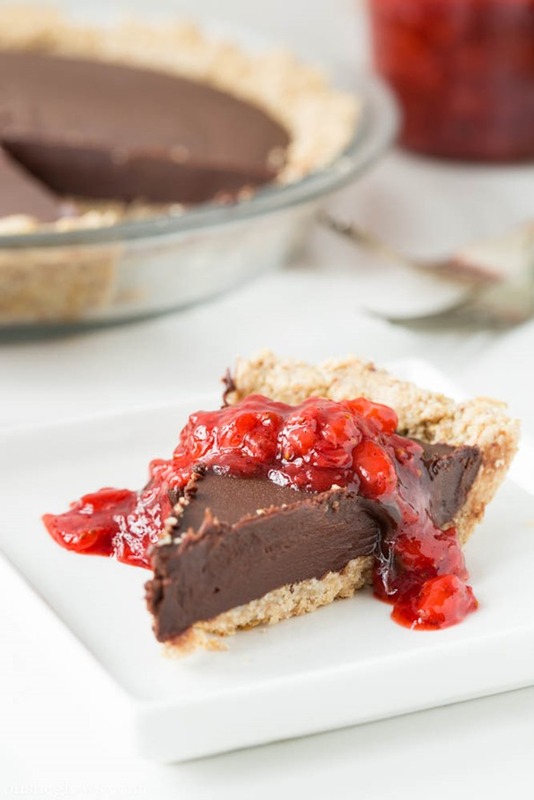 Your combination of oaty crust, sweet strawberries and rich gooey chocolate look incredible. Oh my goodness- I love everything about this post! This looks delicious! I just started following your blog and going through old recipes, and it’s amazing! How much coconut cream was used? I have a giant can of coconut cream at home, could I sub that in instead? Beautiful recipe with very helpful pictures. Gotta pin this! I found this post to be very inspiring. Good job on making it to where you are now :). The picture at the bottom makes me wish I could reach through the screen and take a bite! I’ll have to make this to see how wonderful it tastes. YUM. I’d kill for that cold chocolate pie right now. Can’t wait to make this, my fella is going to love it! Thank you! Yay!! I’m so happy to hear you found your groove back! We all knew you would! Angela thank you for your positive message above. You don’t even know how that inspired me, nor do you know the example you’ve been to me in more ways than you could know. Four years ago I fell in love with your blog and it became proof that my same dream and same issues with food and eating disorders could be turned into something beautiful. Since I started blogging, I’ve had many people tell me blogging was silly or a waste of time. Funny enough, they never even bothered to read it! However, I always thought back to you and knew my dream wasn’t silly. Thank you for rekindling that spirit in my heart with this message. I know you will continue to be an inspiration to us all time and time again, and we all believe in you, no matter what bumps you may find down the road! Your pie looks amazing!!! Love how thick the crust looks!! That filling looks so incredibly rich and thick. I made ice cream with coconut milk recently and when I chilled it in the fridge the mixture went wonderful thick and soft – I can imagine made with coconut cream it’s even more amazing! [ Smiles ] Oh wow! Dark chocolate pie with almonds on strawberry; looks delicious. It also looks fattening too! Thank you for posting another wonderful vegan recipe! I’m so happy it helped you…all the best with your goals! I had to post to say that I made this pie tonight (complete with the strawberry compote), and it received a resounding … stunned silence from my family. It was pure heaven. Your blog is amazing, and it is the only food blog I use now to plan meals and snacks for our family, which follows a vegan diet. Thank you for all of your incredible work and dedication. I can’t wait for your cookbook to come out! Could anything ever (aside from possibly peanut butter and banana) be better than the strawberry-chocolate combination? I don’t think so. This looks DIVINE. As for the pie: ehrmagherd. That looks absolutely delicious, and the fact that I can make it with GF oats is a huge win. I’m not kidding when I say that I’m drooling as I type this! This pie looks beautiful! I am going to try making it for a family get together this weekend. Everything about this pie sounds delicious. After all, it is a combination of my two favorite things, chocolate and strawberies! This pie looks incredible, like an above poster said, pie is my favorite food group! I think the compote would be wonderful on some toast as well. Or maybe on banana soft serve. Hmm, the possibilities are endless. I love your story! It’s great that you have been able to forge ahead and grow a successful business while staying true to yourself. And this recipe looks perfect for a summer evening! Press-in crusts are definitely my favourite too – up the easy factor big time! But this pie looks divine – that texture! It looks like you’d just melt into a chocolatey pool of goodness! I’m someone who likes her chocolate ‘unadulterated’, as I always say haha, but I would definitely keep this berry compote recipe on hand to use on pancakes. Delish! I just had to say I went to your blog this morning as it is always a treat and I needed a distraction from a big decision I am trying to make. Well, your pep talk was just what I needed to hear. I am going to make the leap into private practice, follow my gut…. Thanks for the beautiful words Angela! :) I loved them! And this pie looks AMAZING! Cannot wait to try it, I especially love the short ingredient list! MMMmmm chocolate + coconut + strawberries = the perfect dessert. well this is probably the most delicious looks pie i’ve ever seen. 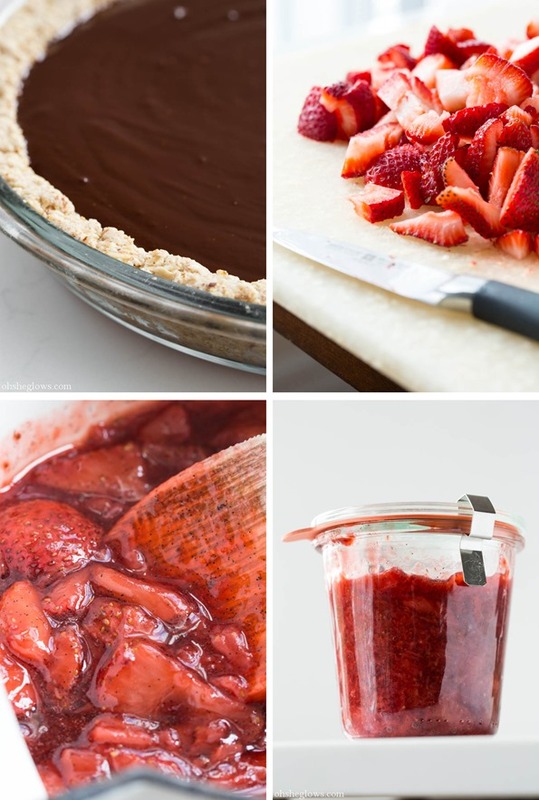 pecan crust, rich chocolate filling, and strawberries. i’ll take a slice! Thanks, Angela. Kind of needed to hear that today. This looks so good! 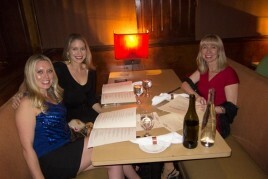 I am lactose intolerant so I am always on the lookout for great deserts without milk! I will definitely be trying this! This may be a silly question but are we supposed to toast the almonds first before we make the crust? Or do they toast themselves while baking the pie? Nope not a silly question at all! No need to toast beforehand…I figured they’d toast while baking in the oven. :) enjoY! You truly are an inspiration – in your authenticity , dedication to your own values, and your unbelievable kitchen creations! I have loved reading your blog for several years and am inspired EVERY time I read! I am so happy to hear you are flowing again with recipes – it means your energy is open and trusting and that allows your true self to shine. Thank you for your commitment and genuine nature. You are a beautiful soul. Just made your date bars which were on my list forever – they were a hit of course! That looks like my kind of pie! Delish! Trying this, this week for sure. Hi Dalbir, Yes you can use regular almonds I would imagine. I’m sorry I don’t know of a sub for coconut milk – my guess would be anything creamy. Maybe try a bit of non dairy milk (maybe 1/2 cup) ? Angela, thank you for these wonderful vegan recipes! I love to cook but your recipes make me even more psyched to get in the kitchen. This pie looks over the moon delicious! I am making it this week. Thank you too for the inspiring words. I am laid up due to ruptured back discs, surgery likely soon. It’s a longish road to getting well so lots of bed rest and time at home. Certainly have time to work on those ideas and dreams I have. You have motivated me to move forward and use my time wisely. Thank you and cheers! Your post was exactly what I needed to hear. Thank you so much for sharing your experience and doubts. As a new blogger but also a health care profession, I have dreams of running my website and blog full time, but it can be very discouraging at times. Thank you for the inspiration. this was fantastic!! I can’t stop eating it :) do you think the filling could be made into a “fudgsicle” of sorts? I am not, nor will I EVER be a Vegan. However I do incorporate Vegan and Vegetarian dishes in my diet her and there and I will say that this chocolate (my fave) strawberry (my fave fruit) looks scrumptious-licious – a definite must try. Okay, I must confess that this is quite revolutionary and it has changed my whole idea and concept of what a vegetarian diet is, or should be. Who could ever have imagined that with dark chocolate pie and crusts of almond mixed with strawberry vanilla, this is the end result? I always imagined a typical veg diet to be nothing more than some greens and leafy stuff but you have successfully reoriented my understanding in that direction. For this, I thank you and I must say that your steps are indeed very easy to follow. I will surely tell my friends about your blog! Definitely trying this recipe – I can no longer have dairy and was wondering what kind of chocolate chips you used. How come you can only freeze it for a week? What happens beyond that? I made that frosting this past weekend to put on some brownies. Delish! This is another one I’ll have to try! That frosting is brilliant! Oh my gosh. This pie looks amazing! And a perfect way to fix chocolate and pie cravings immediately. Yum! I made this pie last night for a friends birthday and was blow away at how delicious it is! Truly divine. The crust could be eaten by itself and the filling is the most amazing creaminess! Thank you for this recipe! Apologies if this has been asked in the comments already (I haven’t gone through them all) but I was wondering if you had a suggestion as what I could use to replace the oats? I do have a pretty severe gluten allergy and I tend to avoid all oats (even the gf ones). I was thinking that I could simply omit them and maybe increase the amount for all other ingredients? Open to anything! Can’t wait to make this. Thanks again. Hey KP, Hmm, I’m really not sure. I would probably suggest using my no-bake crust 9http://ohsheglows.com/2011/06/03/chilled-double-chocolate-torte-the-no-bake-version/) Do you think that quinoa flakes might work? Can you tolerate those? I actually made it this weekend and used a little brown rice flour and I did use quinoa flakes. Holy f it was awesome! I was worried that the quinoa flakes would be a bit too “quinoa-y” but the chocolate totally overpowers the flavor of the crust (which was great). If I took a bit of the crust alone, it had that quinoa flavor, which I dont mind, but otherwise you can’t really taste it – but the texture was great. Thanks again – this was (and is) so so good. I may have had a piece for breakfast with a nice cup of tea! You bet – I actually just replaced the oat flour with the same amount of brown rice flour (1/2 cup) and the oats with 1 cup quinoa flakes. I probably wouldn’t use a full cup of quinoa flakes the next time though. As I mentioned, if I eat the crust alone, you can definitely pick up that distinct quinoa flavor, but it’s not noticeable when enjoying a piece with full chocolate. I have made some people very happy with this cake. Including myself. Great, thanks so much! I’ll have to try it out sometime :) I have quinoa flakes that I had no clue how to use up. Oh my that looks simply divine! I’ve never actually made a pie before but this looks so good I might give it a try. Just the pictures of this shame the apple pie I picked up from Sam’s Club the other day. This pie looks great! Do you think you could use almond pulp left over from almond milk instead of the normal almonds? This sounds just wonderful! Chocolate + Strawberry = Heaven! Great post – very inspirational to watch your growth. What a great encouragement to the rest of us. Just made this pie two days ago for a friend’s birthday. We all loved the pie! The crust it delicious and the filling is smooth and creamy. I picked some wild strawberries for the compote, but only managed to pick 1/2 a pound. Even this small amount of berries was good. A bit of berry tartness with the chocolate was great. I made this the other night and the hubby devoured it. Sooo good. The funny and odd thing was, I bought two small cans of coconut milk. Same day, same brand. One did what it was supposed to, the other did not separate. I threw the whole can in there and it still turned out. Bizarre but glad it worked. Angela, after two years of following your blog you remain my culinary inspiration and role model! I love your life reflections + advice just as much as your recipes. Can’t wait for the cookbook! Is it OK to replace the coconut oil for the crust with another oil? I don’t have any and my family believes it’s super not healthy..
Hi Angela – sorry I do not have a photo up – I actually have been following your site for years now : ) Amazing..
For the chocolate pie, how do you think a raw crust would work for this pie? (Almond, dates, maple syrup etc ) ? I have a dinner party on Sunday and dessert is my job! I made this recipe and it was delicious! Creamy and decadent. I love the fact you can indulge in chocolate pie and know that the ingredients are all natural and healthy. 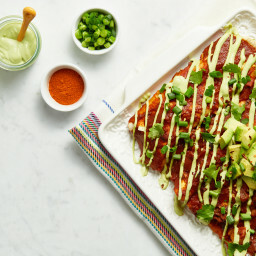 Looks amazing – I definitely want to try this recipe. What kind of chocolate chips did you use? Oh, that looks delicious! Yummy! I bet fresh strawberries would go with this, too! I love that you started with a little of your story/struggle/trip through starting your own business. I agree that you have to be 100% true to you and your priorities and if an opportunity doesn’t mesh with those then leave it behind! As for the pie, it looks amazing. I am excited to try the crust out. I may have found a new crust for holiday pies! OMG!!!! What a heavenly made chilled chocolate pie! This really makes me hungry right now!!!!! Ugh, such a perfect dessert! Love how you made the strawberry vanilla compote. Yummy! This recipe is delicious! I made it last night but rather than making a pie, I made tartlets (more BBQ friendly). I made them in my mini-cupcake pan and used 1/2tbsp of the crust mixture per tartlet. I baked them for 10 minutes, cooled them, filled them, froze them for 10 minutes, and topped them with fresh berries. I have about 2 cups of leftover filling but I’m sure it won’t be around for long! Thanks for the recipe! This is an inspiring post, Angela! Nope :) no need to! Thanks for this – it’s perfect and came at the right time. My husband is making this for my birthday today!! This was devine and the perfect Birthday treat! So good!! Total keeper in our household!! I just made this pie- thank you for a recipe, as I’ve been craving chocolate pie! I switched it up a little: vegetable oil in the crust since I didn’t have coconut, and also a whipped cream made from coconut milk instead of fruit compote. Just found your website and seeing your chilled dark chocolate pie has made me realise that it is almost time for afternoon tea pity we don’t have your delicious chocolate pie to go with it though. I was so nervous to make this, since it looked too decadent to be simple, but it was actually so easy and turned out great! Since we are having a steaming heat wave in Toronto, I didn’t let it cut it immediately after taking it out of the freezer, and had no problem taking out the first piece. The strawberry compote was the perfect addition, especially for the kids who aren’t always a fan of dark chocolate. It disappeared quickly! Holy crap! This pie is obscenely delicious (and easy)! I’m obsessed! It’s perfect for me, my gluten intolerant hubby, and any non-vegan people who are skeptical about dairy free baked goods! I put fresh raspberries on top. It’s super rich, so the tart berries were a great counter balance. This recipe is a home run! This would be amazing topped with (vegan) marshmallows – s’mores pie! i made this with a grain free crust (recipe from costco cookbook): 2 cups almond meal, 1/3 cup (i used 1/4cup) melted butter (i am not vegan or vegetarian) 1 tsp vanilla extract and 1/4 tsp cinnamon, mix and bake at 350 for 10 mins. I did everything else the same except did not add any sweetner to the chocolate filling and only added 1 tbsp maple syrup to the strawberry compote. It is very rich and satisfies my chocolate craving. So I’m two weeks behind the times but I had to give a shout out to this amazing pie! I made it yesterday for a friend of mine who follows a fairly strict Paleo diet, and swears that vegan desserts are always “missing something”. I used gluten-free oats & oat flour to satisfy the Paleo need. He said it was one of the best desserts he’d ever tasted, and didn’t believe me that it was actually vegan. Thank your for the great recipe! I just made this pie today….. Loved it and my little nieces loved it too. I made one change using half peanut butter chips and half milk chocolate chips. I wasn’t sure about the strawberries at first but it tasted wonderful with the pie. My question pertains to the coconut milk. I refrigerated mine as instructed but it never solidified. I scooped it out of the can a spoonful at a time until I got to the very bottom. Then I could tell there was about 1/4 cup of water. What kind of coconut milk did you use? I used an organic brand, unsweetened. I left the pie out for about 15 minutes before slicing and it was starting to run. I’m definitely going to make this again! Hey Stacy, I use Thai Kitchen or Native Forest – the water at the bottom is totally normal. Just use the cream portion though. I made this thursday for a party yesterday and it was delicious! Everyone loved it and it was so easy to make! Yum! This looks so good! Sadly, I can’t do coconut oil at all and have discomfort with the full fat milk- the less oily the less discomfort to me. Do you have any recommendations on an alternative to the oil (and potentially the milk)? Thanks! I woke up sunday morning to this wonderful dessert, so of course I had to make it…and quick as church was in a couple hours. I couldn’t believe how quick it was to make. I didn’t have coconut milk in the fridge so I substituted heavy cream (I’m not vegan). Next time I’ll make it with coconut, I have been wanting to experiment with coconut milk and chocolate! Anywho I mixed it up pretty quick. Put it in the freezer for 20 minutes while getting ready, then moved it to the fridge. I think because I used heavy cream I didn’t need to freeze it for it to hold up. The strawberry compote was perfect and my hubby and kiddos luved it! It’s like the creamy center of a truffle smothered in strawberries…two of my favorite things..it doesn’t get much better than that! Thank you! Keep the awesome recipes coming, sista’!! I made this last night for a group of people that really don’t pay attention to what is in their food and mock my “natural” food proclivities (natural as in ACTUALLY natural). It was a great hit! I love that it’s rich because a very small piece satisfies my chocolate cravings!! Thank you for the great recipe. I’m definetly gonna try this, my wife is gonna love it, thanks for the recipe. Regards from Ecuador. This was just what I needed to read today – I’m 40 and also struggling with pursuing my own dreams, and I find my self-doubt is the largest obstacle of all. (And it doesn’t hurt that your fabulous essay ends with a dessert I can’t wait to try.) What a great find – I’m excited to read more! Hi there, this filling tastes amazing! I’m trying it in separate tarts for a shower. Wondering, did you freeze the compote on it as well? Hi Erin, No I didn’t freeze the compote – just served on top right before eating. enjoy! I made this and it was wonderful. My coconut milk did not solidify when I put in the refrigerator overnight, which made me a little sad. But than I remembered that I could use agar powder to thicken it up, which I did and it turned out brilliant and incredible firm. I used 2 tbsp. This pie is so scrumptious I ate 2 pieces the first time I made it. I made it again the following week, this time making a blackberry-blueberry-raspberry compote instead. My entire family l-o-v-e-d this. Thanks so much! Hi Ava, It should be fine – just try your best to scoop out the white cream portion when you remove it from the freezer. is there any substitute for coconut oil? unfortunately, i just dont like its flavor. Hey Gayle, Not that I know of off hand unfortunately – the coconut oil helps solidify the ingredients. If I think of anything I’ll let you know! You can try to find refined coconut oil. Apparently it doesn’t have a coconut flavour. Not sure if anyone mentioned this, but instead of discarding the coconut water, how about using it in smoothies! This recipe turned out so good! 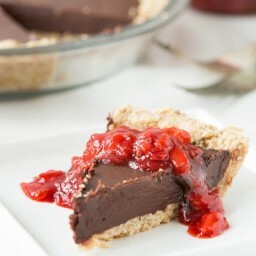 So creamy and decadent, and the strawberry compote is a perfect match for the pie. I used sweet summer strawberries and had everyone asking for more. I was worried about the pie tasting too much like coconut, but I couldn’t even tell that it wasn’t made with regular dairy cream! No coconut flavor at all. Just chocolate. Delicious! Thank you so much, I will be making this again for all of my vegan friends! Hi Michelle, I’m so happy to hear this! Thanks for letting me know. Hello, thanks for the amazing recipe. I have a quick qs – does the taste of coconut come through? I am planning to make this today for my son’s bday and he is not a huge coconut fan. While we are vegetarian we are not vegans. Thanks! 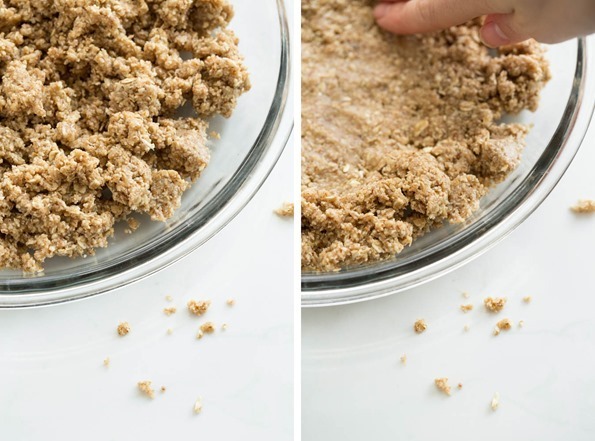 Could I use almond flour instead of oat flour? Do you have any suggestions of a substitute for the rolled oats? Your blog was recommended by a friend and I’m loving what I see! Thank you for another brilliant recipe! I made it yesterday but was too impatient for the coconut milk to get cold, it still separated a bit and turned out wonderful nonetheless. Looked harder to make than it actually was. I also used Agave in place of all the maple syrup. I made this over the weekend for my birthday dinner. Nobody in our family is vegan, but my husband and mom are trying to cut out gluten from their diets. Everybody loved it! Thank you for the wonderful recipe! Seems this might not be the ‘right’ place to share this, but here goes. Using components from three of your recipes, I made an almond, caramel, chocolate cup. I used the base from Raw Almond Butter Cups, the date caramel from Homemade Crispy Twix Bars, and the chocolate from Chilled Dark Chocolate Pie. So good! Hey Jill, We must be on the same wavelength because I just made something like the a couple weeks ago! :) So good right? Thanks for sharing! This came out amazing!!! My boyfriend who is not vegan adored it. Thank you! I really wanted to love this pie. Unfortunately I will not make it again. The crust was way too dry and the filling was too fudge-like & dense. I’ve been on a search for a vegan chocolate pie since I stopped making my tofu version (trying to get off soy) but this wasn’t it. Thanks. I made this pie for my grandma’s 100th birthday celebration this past weekend, and it was a hit! My son has every allergy in the book, but fortunately he can have almonds! I made this with Enjoy Chocolate Chips, and I brought it to the party, so he could have something delicious while everyone else ate the standard fancy desserts. But everyone was so intrigued by my dessert that they all wanted a taste! It was super rich, so a little bit went a long way. My son has never tried a pie before because of his allergies, so he was in heaven. I can’t get over how easy the recipe was and how few ingredients there were! I didn’t have time to refrigerate the coconut milk overnight, so instead I froze it for two hours, and the results were great — it was super easy to separate the fatty part from the watery part. Thank you!! I made this pie and it was so rich! My husband won’t let me make it again without some kind of adjustment. Any ideas? I loved it, but I have to agree it was super rich. I just made this pie for Thanksgiving and my whole family loved it! So delicious! I will be passing out the recipe. This looks delicious! Has anyone tried freezing this pie? I’d like to make one and freeze it for the holidays, but I don’t want to ruin it… I’m thinking it should work but I wanted to see if anyone else had tried it. We made this for Christmas dinner, but skipped the strawberries. Instead, I spread a layer of natural peanut butter on the crust before pouring in the filling. It was a huge hit!! Delicious! Made this for Christmas. Trader Joe’s brand coconut milk seems to be the only one in my area that works for these types of recipes. Compote was not necessary. Fresh strawberries would supplement quite nicely (if you can find them this time of year). Everyone was sick and couldn’t taste it…except for me…MORE.FOR.ME! I made this pie and the crust was really nice. Now I’m wondering if I can use this crust also for another kind of pie, that needs to be baked more time in the oven (pie with topping made of blueberries, which are frozen in this case). Should I prebake the crust, or does the crust get very hard if it’s over 15min total in the oven? 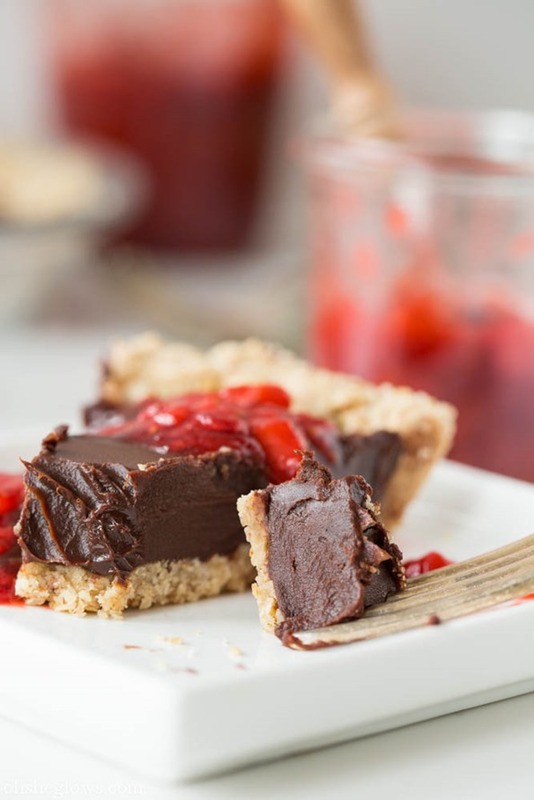 I would really love to make this pie for my dad because he loves chocolate pie (processed full of sugar kind) and he is trying to lose some weight for 2014. I have all the ingredients to make this pie tomorrow but before I do I was wondering how the texture of the filling is after it sits out for 30 minutes because I froze some coconut cream as an experiment and it was rock hard. Deff not suited for pie. Do you think the texture would be the same if I make coconut whipped cream with coco powder in it then froze for a lower fat version, no chips? I made this pie 2 times now for a ‘non-vegan’ party, but everybody just loved it! And it is delicious! The last time my coconut milk didn’t separate in the fridge, so I just used 3/4 of the can and went ahead and made it anyway. The filling doesn’t set as much, but has a goeey and soft texture. Really good too! I made this over the weekend for guests and it was amazing! Thank you so much for the recipe! Just wondering, is there a way to make the chocolate flavour slightly less intense? Would you add extra coconut cream and less chocolate? Can I use Safflower oil instead of Coconut oil? Also can I use unsweetened Almond Milk instead of Coconut Milk? I want to make this for our Valentines dinner. Angela! I just made this pie for my birthday (as I don’t’ like cake, and I needed a vegan something special to celebrate with), and it was fan-freaking-tastic! I actually just used fresh strawberries on top instead of making the compote, a much quicker alternative, but tasty none the less. My step mom also pre-ordered me your book and I’m SO excited!!!! Thank you for all of your wonderful creativity! Hi ! This recipe looks delicious. I want to try it, but as I live in Mexico, oddly enough, only have access to raw cocoa seeds. How could I go about the chocolate chip part? thanks in advance and yummy!!!! Hi Angela, thanks for the wonderful recipe and inspiring post. I made this pie tonight and it turned out great, it’s actually quick and easy to make. It’s not quite strawberry season yet so I made an orange compote, which turned out pretty good. The crust is absolutely delicious! and so is the filling, to be honest. Thanks again! Wow, this pie is amazing! I made it for valentines day and it was the perfect fancy dessert. Usually I am nervous to try anything more complex than cookies but this turned out to be really simple to make! I appreciate that there aren’t that many ingredients, yet it is so rich and delicious. Perfect. Thanks so much! Thank you…..just so very much. This looks amazing! Was just wondering how long you think the can of coconut milk should be chilled for? I am always a terrible planner and forget to put things in the fridge the night before (oops) but I will not be making the filling for another 5 or so hours so if that’s long enough I might be in luck! Made this tonight with my daughter. Super rich and yummy! Will definitely be making this again. Tried making this pie, the crust is great but the filling is not! Its basically just melted chocolate chips, it’s way too sweet, it needs something else in it. OMG this was amazing!! Such a fantastic end to our Easter dinner. Everyone loved it. The non-vegans didn’t even realize it was a vegan dessert. So rich and chocolatey. I made mine in a tart pan with a removable bottom so it was super easy to slice neatly. Plus it gave the pie that fancy-looking scalloped edge. Thank you so much for this! It’s now my new go-to chocolate tart recipe. Thanks so much! Your recipes look awesome! I made this using half unsweetened baker’s chocolate and half semi-sweet. 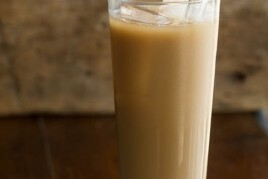 I imagine you could use only unsweetened, since the fat from the coconut makes it that silky consistency. I stored this in my fridge over night after serving it for dessert at my dinner party (big hit, by the way) and it’s the perfect consistency straight from the fridge after setting in the freezer. OMG Angela, you definitely glow :):)! I just made this pie and I can’t believe the taste OMG OMG its awesome!!!! I will definitely glow tonight when my friends try this pie :). I had to sample it just in case :):) yummmmm is right! Thank you so much, you really inspire me! So simple but amazing! This was one of the desserts that I enjoyed very much. I love pie and this was a great pie recipe that I would make again. If it would be possible, please also share a recipe for Cream Pie. It’s hard to make creamy desserts vegan without significantly altering taste and texture, considering that traditional cream is made of milk and eggs. I would definitely love to see your version of Vegan Cream Pie. I have failed at coming up with a good recipe myself. I have also googled it but didn’t like that the recipes seemed so unhealthy. I don’t think that refined white sugar and margarine should be main ingredients, knowing that there are other healthier vegan ingredients available. I made this today, and it tastes as amazing as it looks ! So yummy. Thanks Angela, love your website! Hi Angela! This was really, really good! I made it for lunch at a church friend’s house, and it was very well received. My fiance had to be physically restrained from eating the chocolate mixture when I made it in the pot! I omitted the sweetener in the filling and used 85% dark chocolate – it was so rich that a tiny slice was quite sufficient. Loved the crust too (: Thanks for yet another wonderful recipe! This looks amazing! I’m gonna make this for the 4th! Just a top though, if you’re planning on making this 100% vegan, make sure you use dairy free chips. Thank you so much for sharing! This was awesome!! My coconut milk didn’t separate so I just used the whole can, didn’t freeze the pie but let it set and keep in the fridge–consistency was perfect and the taste was absolutely delicious!! Don’t forgo the compote, it truly makes it gourmet!! This pie was so rich and decadent, and I topped it off with some coconut whipped cream! So good, will definitely make again. My friend baked this over the weekend and brought me a slice to taste. It is A M A Z I N G. Beautiful crust, gorgeous filling. Highly recommended! Hi, I would be making this pie for someone who has a tree nut allergy. Do you think I can substitute peanuts (he’s not allergic to them) for the almonds in the crust. This pie looks amazing. I am thinking about making it for Thanksgiving because a chocolate pie was always my favorite since I am not a fan of fruit ones. Now that I am vegan it is harder to find the perfect chocolate pie recipe. I am thinking about trying this out with the coconut whipped cream on top instead of the fruit — do you think that will taste good? This will be my first time baking a pie! Thank you for you fabulous book and website! Great pie. Made it couple of days ago, and I was impressed. Quick question, when mixing the chocolate and coconut cream, it great this layer of oil. Which transitioned to a thin white layer of frozen coconut oil on my pie. Hi Angela, I love this pie, I made it twice now. Thank you for great recipe. I have a question can you freeze the chocolate pie in whole. I’m doing a party and don’t have much time to make some things so I thought I could maybe do a head of time and freeze it. What is your suggestion on that? It got a tiny bit of freezer burn but once we put it on the counter to semi-thaw it went away and didn’t detect any strange taste at all. Made this tonight and it is DELICIOUS! I haven’t tried a single one of your recipes that I haven’t adored. THANK YOU! Just made this for our valentines dinner date at home – delicious! Best vegan dessert ever! Hi all! I made this pie two nights ago for a friend’s birthday. I opted to not use the chocolate and use raw cocoa powder instead. I soon realized that the consistency was not what it should be (oops). So, I took the remaining coconut milk water and put it in the processor with chia seeds and added it into the mixture. Crossed my fingers and waited for taste time. Delicious! Such a healthy option for an indulgence! Thank you for the inspiration. 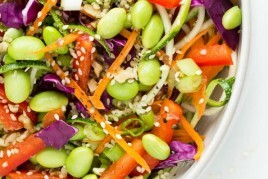 Next time, I’m sticking with the chia seeds and adding some shredded coconut – yum! What chocolate chips to you use? I am trying to find some without soy lecithin. Can you share the brand? Could I use this crust for an apple pie? 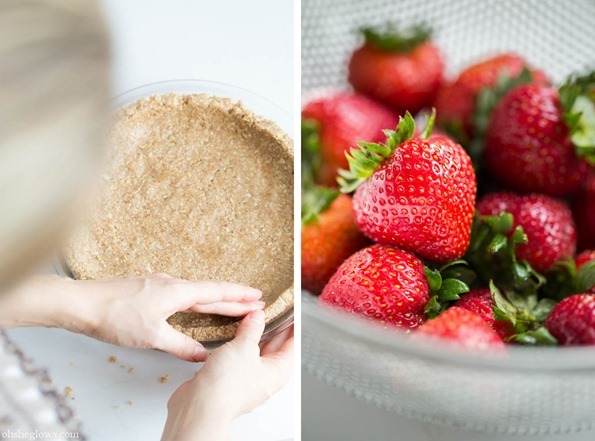 Would i have to bake it before hand or just bake it with my pie? Looks delicious! I am really looking forward to making this. I am in the UK so unsure of cup measurements. Can anyone help me with what the measurements will be in grams (or oz)? Thanks. This recipe is delicious! Just made it for a second time, I made 6 mini pies in a large muffin tray and they are scrummy, such a nice texture, and will definitely make again! So… This pie is becoming a weekly thing in our house after my husband said it was too rich and then proceeded to sneak bites directly from the freezer (with a fork) over the next 2 days until it was gone. I have a crust cooling right now so I can make it again. I’m trying it with a graham cracker and pecan crust this time. Thanks for sharing this one. Definitely a hit, and it’s going with me to our next family gathering for sure! 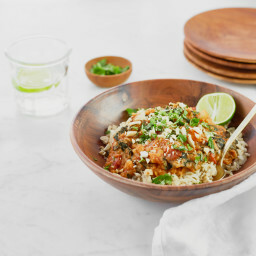 I would love to try this recipe but have a food sensitivity to oats. Do you have any suggestions as to what I might use to replace the oats? On a related note, many of your burger recipes use oats, as well. Any suggestions you have as to what I can use as an oat substitute in burgers would be greatly appreciated. Love your recipes! Made the Black Bean Quinoa salad last night for dinner and am making some Endurance crackers today to go with the leftovers – yum! Thanks for all your creativity in the kitchen! I love this cake! I’ve made it a few times but my oven is broken and I need something for a party this weekend. Would it work with a no-bake crust? I made this pie for all my non-vegan house mates and we all LOVED it! Everyone was asking for seconds and the whole thing was gone within the hour! Hi Angela! I have made this before and it was so delicious! But I forgot what I replaced the oat flour with.. I have tapioca flour, coconut flour, all purpose, and gluten free baking flour. Would any of these work or should I buy oat flour? What do you think about using almond flour as well? Thanks!! This looks perfect but I have one question… Would I be able to cook the day before and leave in the fridge over night??? I made this for Mother’s Day and it was a huge hit! The crust is amazing! I’ve never made gluten-free crust this good. The chocolate filling is fantastic too. I like my chocolate dark and bold, so I left out the sweetener. This would be great to bring to a party. I’ll definitely keep this one in mind. Guys, this one is one of the BEST CAKES EVER! Thank you for this recipe, you mylady, are a genius. Hi! I found this recipe while looking for something to make for a cocktail party. I made it in cupcake form, and it was absolutely amazing, incredibly rich, and delicious. I wanted to thank you for posting this. Thank You for the great comment, Elinor! Mini versions – what a great idea! I’ve made this pie a number of times, always with great success. I’m not a huge fan of almonds, so I usually use hazelnuts in the crust and it turns out amazing. I have also made these in a cupcake pan for little mini pies, which people always love. It really is my go-to dessert when I know I need to please a crowd with very different dietary preferences. Thank you for this fantastic recipe! Thank YOU so much for sharing all those helpful tips and tricks, Raquel! I love them. Beautiful pie, will make it for christmas! Do you use ordinary dark chocolate chips with sugar in, or 100% cacao? And do you think both versions would work? Hi, I love your recipes… I would really like it if you would include the prep time on these so that at a glance, I could see if I have the time to make it., rather than my having to read through it and then trying to gauge how long it will take. Thank you for your wonderful recipes. Sorry, after I clicked on the recipe to download it, I saw the prep time… wasn’t able to see it before that. Thank you, Angela. I’ve accidently brought full fat coconut cream! :( will this work?? 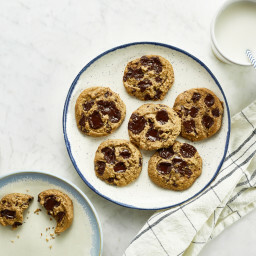 I’d love to make this for a family gathering this weekend, but was wondering if subbing the chocolate chips for cocoa powder or something to that effect would work? Any thoughts welcome! Thanks for another beautiful&fail-proof recipe. Hi Ruth, I don’t think it would work, unfortunately, as the chocolate chips provide sweetness, and also a firm texture once chilled. This pie is delish!!! You’re amazing and I’m totally inspired. Thanks so much. BURNING QUESTION: We made this pie last night for thanksgiving today! I made the compote, because our host has a very small kitchen. I put it into a mason jar: can I reheat it successfully with the microwave or in a pan of water?? Thanks so much!! Hey Angie! Loved the recipe will try it for Christmas dinner , can I use stevia to sweeten it? Hey Barbara, So glad you enjoyed the pie! I’m not sure about stevia unfortunately. I don’t bake with it so I wouldn’t know what to suggest. If you try anything please let us know how it goes! Just made this pie yesterday and the crust is great, crispy & delicious! I did have some trouble with the filling though–while stirring and melting the chocolate and solidified part of the coconut milk, it suddenly became clumped up and oil started separating out in big amounts. Has anyone else run into this? I couldn’t fix it and had to try over. Second try was better, but as soon as I saw some clumpiness, I quickly poured it into the shell and into the fridge. Seemed to work, but I’d like to keep it all smooth next time, any suggestions?? Hey Ayla, Oh I’m so sorry you had trouble with the filling! I haven’t experienced this before but I think it could be due to the cold coconut cream? You may have better luck warming the cream over low heat first and only when the cream is warm (but not hot) stir in the chocolate. Also make sure that the maple syrup is at room temperature and not cold as well as cold maple syrup can cause chocolate to seize as well. I hope this helps and please let me know how it goes!